PACK up and go, a customer advised two young men, one month into their running of a ramen stall at a Tanjong Pagar coffee shop. "She said she could guarantee that we would not succeed," said Mr Cai Weisheng, 25, who runs the stall with his 28-year-old brother Weili. "I felt quite angry because there was nothing I could do, but it's something that pushes us forward," he added. While the profession, known for its long hours, hot working environment and demanding customers, is starting to draw younger players, they are still a minority. However, with the Government's plan to open 10 hawker centres, observers say there are opportunities for more people, including the young, to be their own boss. Two groups have also been appointed by the Singapore Workforce Development Agency to train more than 2,000 people to work in hawker centres, food courts and other food shops. A recent Youth Hawkerprise campaign by four Nanyang Technological University students also explored the prospects, with the Cai brothers among eight young hawkers featured in a photo exhibition. Four of the eight hawkers also shared their experiences in a one-day workshop attended by industry experts and aspiring "hawker-preneurs" - a combination of the words "hawker" and "entrepreneur". The campaign was mentioned in Prime Minister Lee Hsien Loong's Facebook page on Jan22. While there are stories of hawkers who make it big, young people who intend to enter the trade need to be realistic, said Ms Nur Huda Johari, who is also featured in the campaign. "It's not that easy to work in a hawker centre. 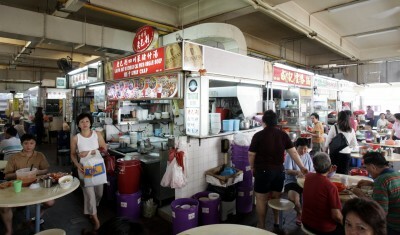 You need to serve customers and work in a place without air-conditioning," said the 25-year-old, who runs a Malay food stall with her mother at the Ayer Rajah Food Centre. They may also have to deal with difficult customers. Said Mr Abdhus Salam, 27, who runs an Indian rojak stall at the Ayer Rajah Food Centre with his father: "After hearing the cost, some customers will ask you for the breakdown. Some will understand, but some will compare it to the things you buy from the market." But there is satisfaction when customers praise the quality of the food or say they have come because of recommendations from others, he added. Ms Mazey Tan, who was among the more than 100 people at the workshop on Jan26, wants to set up a hawker stall selling her own version of local coffee. "Who knows if it might grow into something big. Even if it doesn't work out, at least I can say that I've done it," said the 34-year-old oil broker. Ms Elim Chew, founder of fashion label 77th Street and head of a public consultation panel on hawker centres, said there had been an average of 700 start-up food businesses in the last few years. She feels that youth hawkers can whip up exciting and creative ideas. "They can grow from hawker centres and expand into food courts, outlet cafes, restaurants and even go global," she noted.